Okay, back in June of 2015 I posted my “Swagbucks 101” on how to earn Swagbucks. The website however is ever changing and evolving, so with that comes updates. I’ve updated the original post, but now it’s time for another update. 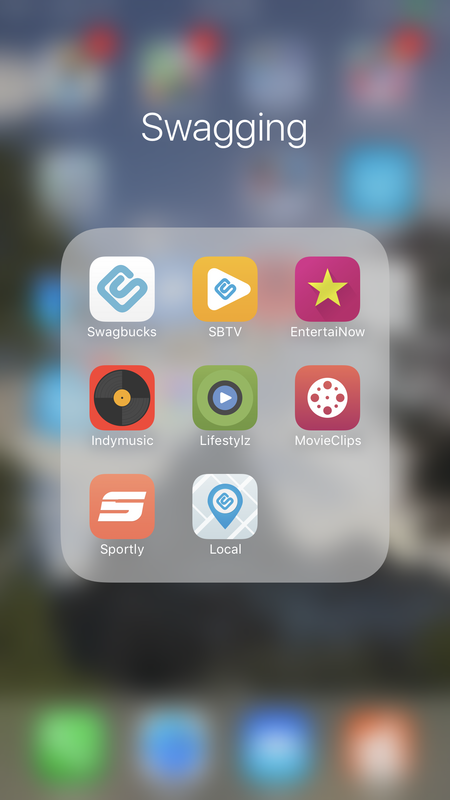 My last two posts have been about Swagbucks, so I figured I may as well go for a full update! So here it is… pin this, soak it in, and start earning towards your Disney trip! nCrave Activities– This is one of the easiest way that I’ve found to earn Swagbucks- on the Swagbucks home page there are categories along the left hand side of the page. Click on the link that says “Watch” and you should see the the world “ncCrave”. You can click on this and it will take you to an entire page of activities. The activities that have a circle and arrow will auto run, so you can just leave it running on your computer for about 10 minutes and earn up to 1-3 Swagbucks. Different offers are worth different amounts. I run these almost all day and earn between 50-100 Swagbucks per day with this and the other activities. Occasionally there are nCrave activities worth 5-6 Swagbucks! I jump on those whenever they’re available! Surveys– Under the “answer” tab on Swagbucks down at the bottom are paid surveys. When first getting started using the surveys I would recommend doing the little 2 point surveys on the right hand side. They take a while to get through, but what you’re doing is pre-qualifying yourself for the larger surveys. When you’ve gotten those done your chances of getting surveys that you’re qualified for increase. You may start some surveys and get disqualified after 5 minutes (you’ll still get 1 sb in that case), but I’ve also had plenty of surveys where I’ve gotten 50-150 Swagbucks within 30 minutes, and just last week I got 60 Swagbucks for a 3 minute survey. I mean if you’re bored anyway why not try it. Swagbucks TV – Also under the “Watch” link is SBTV. Video sets are worth 1-3 Swagbucks, and will always tell you how much they’re worth. I’ve found that some browsers and computers will allow you to watch all the videos in succession without clicking, while others are more finicky and you have to click on each video. It’s still easy to click through and watch the Swagbucks add up! I usually do this while I’m watching tv. They’re easy to click through without paying attention while you’re watching tv or a movie! Games– Under the Play tab there are 3 games you can play and earn Swagbucks. When you get a game over keep playing, becaus every 2 games you play you get 2 Swagbucks, up to 10 Swagbucks per day. Searching the Web– Okay so Swagbucks in addition to all of its other features is a search engine. It actually has significantly improved in the past few years. The search engine now goes through Yahoo and the quality of the searching is better. On my laptop, I have Swagbucks set as my default search engine, so any time that I search it goes through Swagbucks with the chance of me earning some bonus Swagbucks. Sometimes you’ll get little search wins worth 4 or 5 swagbucks and some times you’ll get larger ones. Just last week I got my largest search win yet- 100 Swagbucks! It was AWESOME! Special offers– Under the earn tab there is a special offers link. Sometimes there are random videos to watch that’ll take between 30 and 90 seconds, and sometimes there will be things where you can earn 15 sb for liking a page on Facebook. There are lots of different tabs across the special offers page. Usually the radium one and peanut labs have the best offers. Shop and Earn- Do you shop online??? If you are an online shopper try using Shop and Earn through Swagbucks! (It’s also under the shop tab on the left hand side) All you do is click on shop and earn, and click the store that you want to shop (they have tons… I mainly use Kohls, Groupon, and Home Depot). It will redirect you to the store you’ve selected and you just do your shopping like normal! Usually they’ll give you at least 2sb per dollar spent. Sometimes they will run specials where you can get 4 sb per dollar or even 8 or 10 sb per dollar!!! I’ve earned a lot this way! I always buy my Groupons through the shop and earn! They will not post immediately, usually shop and earn points will be award one month after the purchase date. This is especially great when doing Christmas shopping! You can shop from the comfort of your home in your PJ’s with a cup of coffee AND earn Swagbucks while doing so! Swagbucks Goal– On the Swagbucks homepage you’ll see your daily goal meter at the top of the page. Swagbucks sets a daily earning goal for you based on how many swagbucks you normally earn. If you hit the daily goal you generally will receive a 10% bonus back. For example, your goal is 50 Swagbucks, your bonus is 5 Swagbucks. When you hit the goal your bonus Swagbucks will be awarded by the 5thor 6thof the following month. If you hit the goal 7, 14, 21, or the entire month in a row there are additional bonuses! In the past I have hit the daily goal every day for 30 days straight and received a 300 Swagbuck bonus in addition to my daily goal bonuses! So there it is! My updated Swagbucks 101. If you haven’t signed up, do it! Click below and you can get started with $5 for free. Think of all of the sweet sweet $ that you can save for your Disney trip! Be sure to follow the Mouskaholic to stay up to date on Disney News, Tricks, Tips, and TONS of other information!